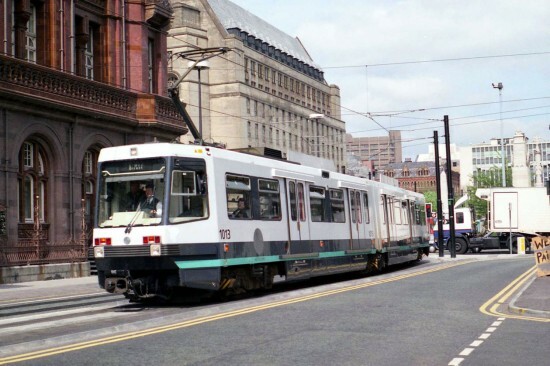 Today’s Picture in Time comes from Manchester Metrolink once again as we feature some images of 1013 during April 1992. 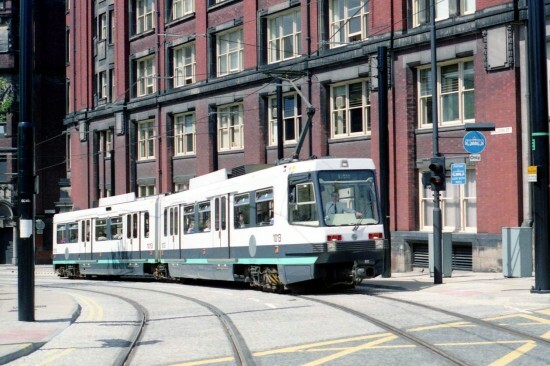 1013 was originally delivered to Manchester on 30th January 1992 and was then used on the first day of service – 6th April 1992. However in between being delivered and entering service it had derailed at Victoria (March 1992 – only minor damage) but then settled into the standard operating pattern. A trip to Wolverton Works followed in November/December 2004 for refurbishment works and then in February 2007 there was another derailment, this time at Queens Road Depot but again only suffered minor damage. The tram was withdrawn from service on 2nd December 2013 and then went to Rotherham for scrapping the following September. Two views are shown here of 1013 on the first day of cross city operation – 27th April 1992. We first see the tram moving away from St Peter’s Square as it heads to G-Mex and then later on the same day we are on Balloon Street close to Victoria Station.